After taking the fight to Florida only weeks ago over their harmful new proposed legislation SB 818 to increase the approved ratio of pharmacy technicians to licensed pharmacists, similar legislation is also under consideration in South Carolina. The South Carolina Pharmacy Practice Act if passed would increase the same ratio, as well as discontinue the current requirement for Live Continuing Education for pharmacists and pharmacy techs in that state. As you are all well aware, I am adamantly opposed to any type of such legislation and am attempting to wage a small war against these practices. I wrote the following letter to Senator Shane Martin of South Carolina’s 13th District. The stated goal and actionable practice of the Emily Jerry Foundation is to give each and every person we come in contact with respect and the benefit of the doubt upon first beginning a correspondence or personal relationship. Our purpose is to save lives, and we feel tactics that are too aggressive and hot-tempered mostly result in a lose-lose situation. My personal view is that the vast majority of politicians obviously care about the safety of their constituents or they wouldn’t have chosen public service as a way of life. That is why I am so urgently attempting to educate them, and hopefully help them realize that the policies they are pushing may actually be leading to more harm than good. Please help me get through to them! Contact your friends in the state of South Carolina and have them email or call their representatives today. At the beginning of June, I was honored to give a keynote session at the annual AAMI 2013 Conference and Expo in Long Beach, titled “Changing the Culture of Medicine-A Father’s Powerful Message”. 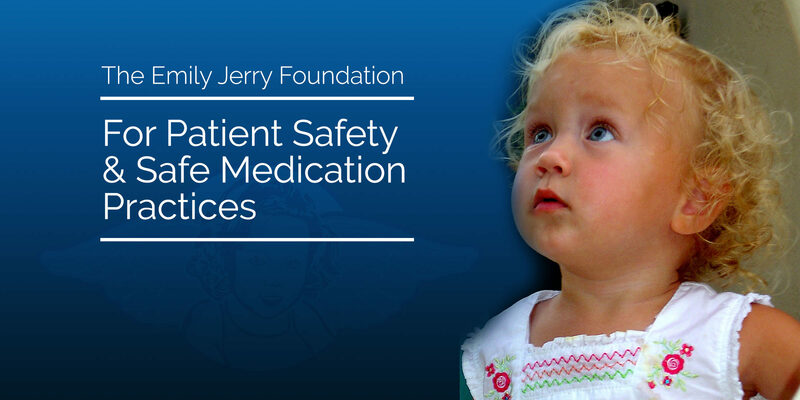 As I have mentioned many times before, ever since I began this journey as full-time patient safety/caregiver advocate and leader of The Emily Jerry Foundation, I have always strived with my talks and the foundation’s programming to be an active part of the overall “solution” to preventable medical errors. For that reason, I have always been a very strong proponent for “smart” implementation of technology in medicine as an effective way to significantly reduce the probability of “human error” in medicine. When I first started the foundation based on this simple core premise, this is why I felt it was imperative, right from the start, that The Emily Jerry Foundation immediately establish solid partnerships and alliances with the key medical technology manufacturers like CareFusion, Codonics, MediDose, SEA Medical Systems, etc. By medical facilities around the nation putting into practice the systems and technology developed by organizations like these, I know for a fact, that many lives are ultimately being saved from tragic preventable medical errors. Unfortunately though, these systems and vital technology can’t seem to be developed and implemented in our nation’s medical facilities, quickly enough, in my opinion. According to recent health care studies over 100,000 deaths occur in the United States from preventable medical errors every year, making preventable medical errors the third leading cause of death in the United States today. I find it astounding, that what this really means is that, unintentional preventable medical harm by caregivers, is only less deadly than cardiovascular disease and cancer! Even in light of these very dismal statistics, what gives me such great hope and inspiration, in my day to day advocacy efforts across the nation, is that I know for a fact we have the capability to fix and address these issues and reduce the number of deaths and harm from preventable medical errors significantly. I also believe very strongly that one day we will completely eliminate them! I am so confident of this, simply due to the fact that, in my day to day work, I come into contact with so many amazing companies, like those aforementioned, and the brilliant individuals employed by them, that just like The Emily Jerry Foundation, are working so incredibly hard every single day to be active part of the SOLUTION. My genuine hope, is that all of the people I had the honor of meeting at the Association for the Advancement of Medical Instrumentation (AAMI) meeting in Long Beach, a few weeks ago, left my talk as inspired to continue their extremely important work in technology development, as they truly inspired me!